by Dave from The Longest Way Home ~ February 4th, 2015. Updated on April 16th, 2015. 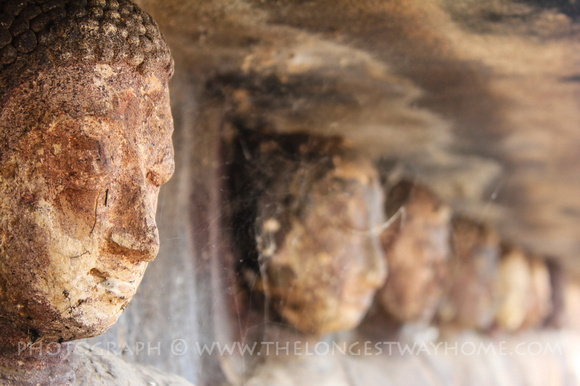 Published in: Travel blog » Thailand. Normally I like to get out and see a town before exploring its main highlight. In Sukhothai’s case that highlight are the stunning ruins in the old part of the city which contains the historical park. 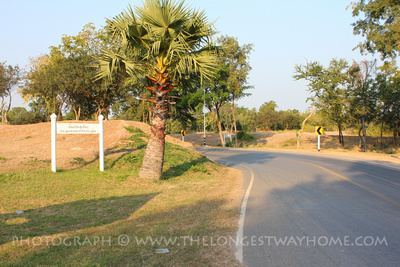 Due to the fact I opted to stay in the new part of Sukhothai I’d have to make the short journey to old Sukhothai. Something that seemed like a nice idea on paper. The plan? Take a walk. The guest house I was staying at on Carodwithithong Rd was family run and very nice. I ate breakfast there as quite frankly it was cheaper than the meager offerings in this part of new Sukhothai. There’s plenty of local places to eat, but Thai breakfasts don’t do it for me. The couple asked me what my plans were. “Really?” I said looking at a map in that ironic way that makes everything seems so close. They were right. 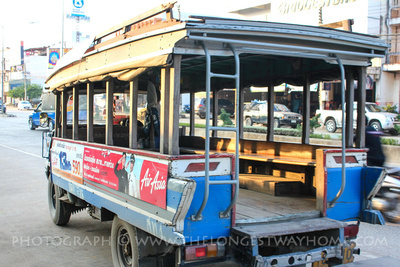 I waited for one of the old blue bus / songthaew’s across the road to come along. They are different to the usual songthaew’s in Thailand in that they are really mini trucks with a wooden covered section in the back filled with seats. It took 15 mins but finally one trundled along and I jumped on board. Being paranoid about being ripped off I asked a local lady how much it would cost. She pulled 20 baht out of my hand and I handed it over to the driver. The other option was to hire a tuk tuk but at 600 baht this type of ride seemed better. It took about 20 mins and we were dropped off right at the gates to the historic park. Easy. Sukhothai historic park is over 70 square kilometers with temples and statues spread out into different sections throughout. A quick walking tour doesn’t cut it here. There are several options. Rent a motorbike (which are banned in the inner park). Rent a bicycle (can go everywhere). Or walk (again you can go everywhere, but it’s really too big an area to cover on foot. Each option aside from walking comes with an additional entrance fee. Bicycles are charged at 10 baht to enter on top of the section price of 100 baht. As this was my first day and I still wasn’t sure whether Sukhothai Historic Park was worth it or not I opted for a bicycle to try and see as much of the “main sights” as possible in one day. Across the road from the entrance are about four different bicycle renting establishments. The cost depends on the type of bicycle but most were around 30-50 baht. They are fairly old though and not that comfortable. I took a rather girly bike with little basket in the front which was great for placing my camera bag and water. I was also handed a lock and chain along with a warning that should I lose the key I’d have to pay 200 baht. Duly noted. The bicycle shops close at around 5.30pm. There’s also an electric tram for 40 baht but it’s limited to the central section. Still, it’s nice if you have small kids or older folk with you who don’t want to be out in the sun on a bike. The only downside is you have to wait for it to fill up. Next up instead of going straight into the historic park I took a right. Why? Well, I was curious if there was a ticket counter further along too. Or, a gap in the fence. Hey? I’d be staying a while and they weren’t offering week long passes. The first thing of due note with this cycle trip was that the bicycle was no speed machine. Five gears and that was it. And the seat kept slipping. I turned the corner and passed the next gate. It was locked. No guards but not really possible to hoist a bicycle over so I kept going. It was now as I toured the inner section of the historic park did I truly grasp its huge size. Another corner and another gate. This time fully staffed. I veered off to the northern section to see the impressive Mat Mahathat complex which wanted another 100 baht. Feeling particularly reluctant to spend money today and knowing Mat Mahathat was better to see in the morning I just tried to have a peak. Sadly, it’s far back from the entrance so I moved on in my first circle of the park. There was some method to my madness in all this. There was lots to explore here and it would take a while. There were literally temples in large plots of land everywhere. Better yet, Sukhothai seemed devoid of tourists compared to places like Chiang Mai or Pai. Coming around the far west of the central historic sight I came across nobody. Just me, a bicycle and a flat road. It was all really easy. Back at the main gates and I finally bought a ticket with a bike add on. Inside and there were only a few tourists visible. Mainly Thai and a few Europeans. There were certainly no crowds. It was a positively refreshing scene compared to the rest of Thailand. I already envisaged coming in and reading a book by a statue or temple. Taking a coffee overlooking one of the many ponds. It all seemed very idyllic. Indeed, the only thing I had to do was get over this daily ticket annoyance. I really didn’t want to have to pay everyday. I’d need to go see someone in charge a little later I decided. I also needed a better set of maps. More water and some food. Before I knew it I was already up to a week of days planned out in Sukhothai. I have little doubt visitors to Sukhothai historic park could see a lot in a full day. Nearly everything in two days. 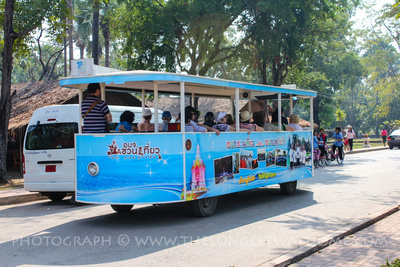 What I really think is a bad idea are the bus tours to Sukhothai. 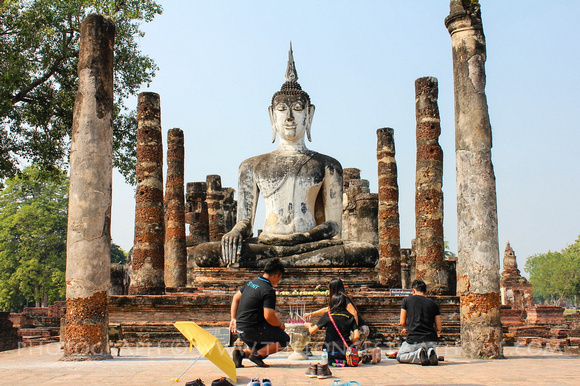 They only spend one to two hours in old Sukhothai. So they only get to see the central area and nothing of the surroundings aside from a quick trip to Mat Mahathat. If you have a few days then it looks like a bicycle will get you to nearly everywhere including to a fitter side of life. The last option of a motorbike would really only work if you wanted to squeeze everything into a day. Aside from the ruins I’ve not even touched on the old city yet which seems to go untouched by most visitors. The only downside I’ve come across so far are the entrance fees. 100 baht each for each section. And there’s 5 sections. Plus an extra 10 baht for a bicycle (though that only seemed enforced in the central historic park). There is however a barely visible sign offering 350 baht for all sections. There’s certainly enough in Sokhothai’s historic park for any temple enthusiast for several days. It’s certainly swung me to staying for a while. Swathes of forest, temples springing up everywhere, very few tourists and it’s all very easy to cover on a bicycle and by foot. I thoroughly recommend anyone planning a visit to do some preparation before arriving to Sukhothai historical park. Get as many maps as possible and plan it out. eg which temple or site is best seen at dawn or at dusk. I’ll document as much of my own experience as possible here and on my guide to Sukhothai Historical Park. Studying architecture in Uni now so this is proving to be interesting. Shame Thailand is one of few Asian countries that still preserve ruins like this. Cambodia also have a lot of ruins, Angkok for example. But yes after that little has been preserved in SEA with regard to historic buildings of age. Japan preserves buildings as does China, but a lot of those are more modern as from temples and buildings in Beijing. I visited here a few years ago. Brings back memories. I remember the old bikes to get around, awful things. Someone could prosper if they brought in better bikes for taller people! I’ve never even heard of Sukhothai before! Shows how much I know and I like Thailand!! Looking forward to learning more about this. I guess that’s a good reason to keep reading here! Lot’s of hidden sites coming up too. But yes, Sukhothai is one of Thailand’s more famous places. I don’t see it mentioned in tourism advertising that much. Bangkok seems to claim all in regards to “temples”. Awesome Buddha photo at the end. I can’t believe they are allowed to pray on such an ancient site. Is that right? Yes, faith is very important in Thailand so there would be uproar if ruins were sealed off. The good side to this is that there is no damage caused by vandalism in Thailand towards buildings of faith. Now this is a place I wanna visit ASAP. Dave, great intro into Sukhothai’s ruins. It’s Indiana Jones all over again. Can’t wait to see what’s there! Yes, it’s very close to Indiana Jone style outings if you rent a bike and stick with the outer sections of the ruins. I read up about Sukhothai last year and got really confused about the old city and the new city. After reading this I finally understand. It’s just a road right? Those old buses really are like cattle trucks!! Pretty close, but they are better than they look. And you only have to stay on for a few minutes! Do you know which belief is the most common in the region that you are? I have heard that it is Buddhism (is not a religion) but do you have other beliefs like hinduism or animism that are caracteristic in Thailand? Yes, about 95% of all Thais are practitioners of Theravada Buddhism which is the official religion in Thailand. As you mentioned Buddhism isn’t strictly a religion it’s more a belief based on teachings. At 95% all other religions are very much in the minority. Islam in the far south is probably the next largest religion but it’s by far a minority.